Cyn: I started thinking about applying for a job that pays more. Bingo: I thought you liked all of your jobs. Cyn: but I could make more money doing something less fun. Except I couldn’t figure out why I would need more money. What would I do with it? Bingo: You could buy things! Cyn: Hm. I could buy up lots of property. Cyn: Build houses. Make more money. Buy more land. Cyn: Then I can tear down the houses and put in hotels. 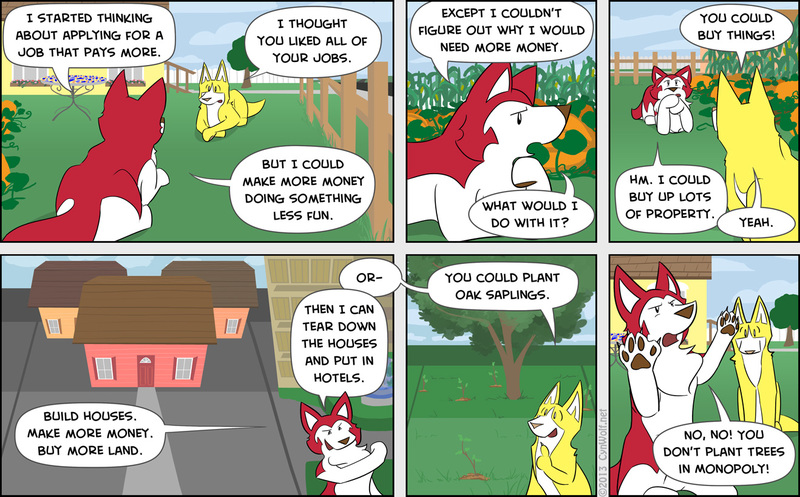 Bingo: You could plant oak saplings. Cyn: No, no! You don’t plant trees in Monopoly!